Reading and share top 6 famous quotes and sayings about Not Losing Your Mind by famous authors and people. Browse top 6 famous quotes and sayings about Not Losing Your Mind by most favorite authors. 1. "Was there ever a great true love? Anyone who became the object of my obsession and not simply my affections?...I could not let myself become that unmindful. Isn't that what love is - losing your mind? You don't care what people think. You don't see your beloved's faults, the slight stinginess, the bit of carelessness, the occasional streak of meanness. You don't mind that he is beneath you socially, educationally, financially, and morally - that's the worst, I think, deficient morals." 2. 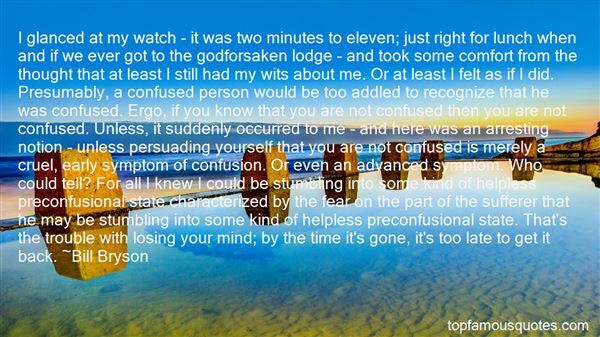 "I glanced at my watch - it was two minutes to eleven; just right for lunch when and if we ever got to the godforsaken lodge - and took some comfort from the thought that at least I still had my wits about me. Or at least I felt as if I did. Presumably, a confused person would be too addled to recognize that he was confused. Ergo, if you know that you are not confused then you are not confused. Unless, it suddenly occurred to me - and here was an arresting notion - unless persuading yourself that you are not confused is merely a cruel, early symptom of confusion. Or even an advanced symptom. Who could tell? For all I knew I could be stumbling into some kind of helpless preconfusional state characterized by the fear on the part of the sufferer that he may be stumbling into some kind of helpless preconfusional state. That's the trouble with losing your mind; by the time it's gone, it's too late to get it back." 3. 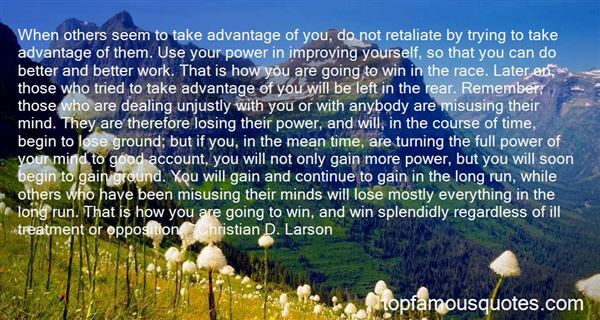 "When others seem to take advantage of you, do not retaliate by trying to take advantage of them. Use your power in improving yourself, so that you can do better and better work. That is how you are going to win in the race. Later on, those who tried to take advantage of you will be left in the rear. Remember, those who are dealing unjustly with you or with anybody are misusing their mind. They are therefore losing their power, and will, in the course of time, begin to lose ground; but if you, in the mean time, are turning the full power of your mind to good account, you will not only gain more power, but you will soon begin to gain ground. You will gain and continue to gain in the long run, while others who have been misusing their minds will lose mostly everything in the long run. That is how you are going to win, and win splendidly regardless of ill treatment or opposition." 4. "You cannot play with the animal in you without becoming wholly animal, play with falsehood without forfeiting your right to truth, play with cruelty without losing your sensitivity of mind. He who wants to keep his garden tidy does not reserve a plot for weeds"
5. "I wonder how long it would take him to realize I'm right as sin - it's the rest of the world that's wrong. I'm not even sure how I qualify for admission to Aspen Springs. Does wanting to die equal losing your mind?" 6. "Why is networking not working? My answer is simple. Many business owners don't have a system in place to leverage their networking. Their time, effort and money spirals down the drain because they lack follow up. Instead of returning to your office, checking the email, and losing that business card in a graveyard box of business cards, continue connecting with your new acquaintance. One basic tip: Connect on social media within two days of meeting them. Personalize your message to them reminding them where you met. When you add this step, watch as your network expands exponentially." I have a 16 year-old son, so I'm now a soccer mom. I stand on the sidelines and I hear the things parents are saying, so I want them to understand what it is their kids are feeling in any sports environment."